Going up the coast with Townsville in mind we decided to start with short day trips and no overnights as the weather has been very mild and enjoyable. We left Mackay after having provisioned to last us for at least a couple of weeks so that we don't need to buy supplies until we get to Townsville. It is possible to buy food and beverages in Hamilton but the prices are outrageous and the variety not very wide. 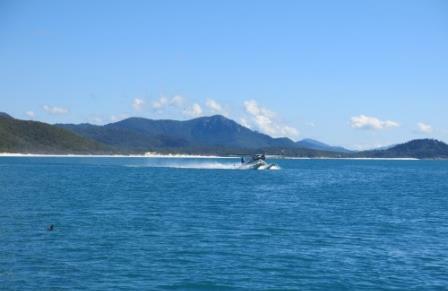 One of the great things about the Whitsundays is the many great anchorages all around 30 miles or less of each other, it makes traveling quite enjoyable. We had left Mackay at 9:00AM, in calm weather, not a whisper of wind, we just motored with the help of a favourable current and by 3:00PM we were reaching Thomas Island, 35 miles NE of Mackay. While pondering whether to keep going to Shaw Island we spotted Axis Mundi at anchor in the beautiful northern anchorage. We then decided to stop there as well and say hello to Shannon and Mark, as we haven't seem them since the previous year. We spent a relaxing afternoon in this place just admiring the scenery after all the hectic time in the marina. It was a good start for the season. After a good night of sleep we raised anchor around 10:00AM and headed towards Whitehaven beach just 16 miles north of Thomas. The weather was still calm and settled, a georgeus day if you don't mind the motor sailing. The tidal stream was in our favour for the trip and we had 3.5 knots current with us on the Solway Passage. This passage is a narrow channel between Whitsunday and Haslewood Islands and it becomes wild in strong winds with strong currents. In case of doubt it is better to time the crossing with the slack tide. Navigation Hazard: You should check the tides before attempting Solway Passage, go through on the slack tide and do not attempt if the wind is over 20knts. Whitehaven Beach as beautiful as always, tourist boats and sea planes concentrated in the southern end. We tend to anchor farther north where it is quiet and head to anchor for the night at the southern end as there is more protection from the swell. This works quite well considering that around 5:00 PM all the tourist operators are gone. We chose our next stop, Langford Island to position ourselves for the next stop at Gloucester Island as Langford is located in the northwestern corner of the Whitsundays. 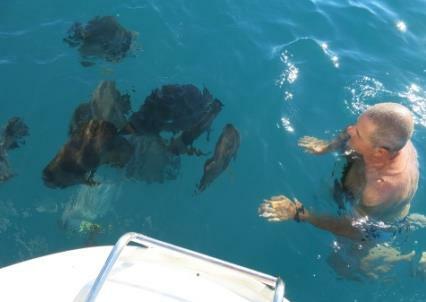 Marine Parks has installed a series of moorings to protect the fringing reef all around. These moorings are exposed to the prevailing winds and usually used during the day only. We would normally cross to nearby Stonehaven in Hook Island for the night, but the weather was settled and calm so we decided to stay for the night. One of the island’s features is its long spit. Despite being covered by the sea at high-tide, the spit creates a perfect beach at low tide which is great for a walk on the sand. You can explore all the way to the north tip but you have to be aware of the tides, which can rise quickly cutting off the spit and let you stranded on it. The reef in Langford is relatively small, but it does contain a huge number of small fish species. There is usually a large number of snorkelers from day tourist boats as the reef is like an underwater garden that encircle the island, it is quite nice. We went for a swim just off the boat and found ourselves inside a colorful aquarium. As it is usual with calm weather in a mooring, Zenitude was caught between the rising tide current and the light SE breeze, each pushing in opposite directions. The result was the mooring ball positioning itself below Zenitude and banging against the hull. Needless to say this makes sleeping rather impossible so we decided to have a look at the mooring lines to check if anything could be done. When at a mooring we usually have a safety line in addition to the regular bridle in case this gets detached (it did happen once before). What a mess of lines in the water we found, the safety line had wrapped around the mooring fittings with a mess of knots. 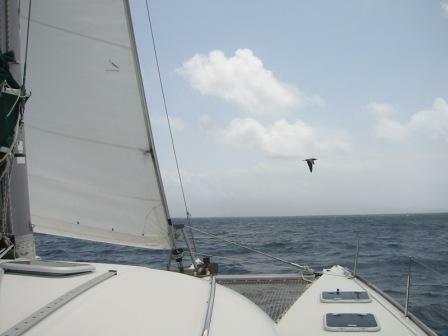 Next thing Oscar was in the dinghy at the bow removing the safety line. After that Zenitude presented better to the wind. Then the ebb tide came running along with the wind and we had a good night sleep, the anchor alarm set on to replace the safety line! From Langford we had a lovely sail in a strait west direction back to mainland in Cape Gloucester, the very northern tip of the Whitsundays, where we spent three relaxing days. Cape Gloucester is where Montes Restaurant and Resort is located, famous among locals for their seafood. Just across is Gloucester Island and the little Shag Islet, home to the "EXCLUSIVELY - NON EXCLUSIVE" Shag Islet Cruising Yacht Club. Check their site for news, events and pictures of the most amazing yearly yacht rendevouz where hundreds of boats congregate for several days of festivities all for a good cause to raise money for prostate cancer. But this time of the year here, there are only a handful of boats. All around, this place is magnificent. There is also the Eco Resort and we picked up one of their moorings. Soon after, went for a dinghy ride to shore to settle accounts with the resort. Moorings at this date are 25 dollars per night with right to use resort facilities. After a walk over the beach we found Montes Resort where we tried to book their famous Sunday seafood buffet lunch without realizing this was Mother’s Day and there was not a chance to get a table for such a busy day. Disappointed at our luck we walked back to the Eco Resort and enjoyed a beer and a beautiful sunset from their beach bar. Across the cape there is Gloucester Island, an uninhabited island with a National Park and camping available on two locations on the beach, Bona Bay and East Side Bay. We were saddened to see bush fires burning in the hills and wondered if people in the camping grounds could have accidentally started the fires which were going freely up the mountain, it seemed there was no way anybody could reach up there. After 3 days relaxing in this peaceful place the weather was right and we left the mooring at sunrise for the next leg towards Townsville. The fires kept burning.